In 2011 and also in 2010 orders for diesel engines categories III an IV, the medium-speed four-stroke trunk piston and the low-speed two-stroke crosshead engines, both suitable for heavy fuel, were meagre. Remarkable is the interest and increase of the number of ordered dual-fuel engines with heavy or diesel fuel as pilot fuel and natural gas as main fuel. Especially the transport of liquid natural gas with gas tankers, the LNG tankers, is remarkable. 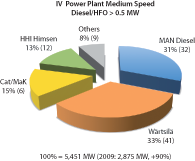 Also the use of dual-fuel engines for power plants is rapidly increasing. Compared with the total number of orders for diesel engines in 2011 it is still a small percentage. See also the Special, dual-fuel engines. 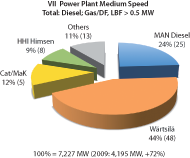 Medium-speed diesel engines, category III, HFO. 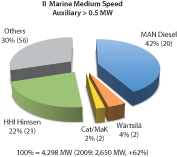 Medium-speed diesel engines, category III, gas/dual fuel. 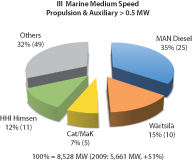 Medium-speed diesel engines, category III, liquid biofuel. 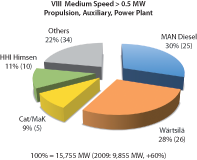 Medium-speed diesel engines, category III, total overview: diesel, gas/dual fuel, liquid biofuel. 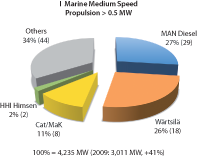 Category III, total overview: propulsion, genset and power plant. Low-speed two-stroke crosshead main engines, category IV, HFO. Overview of diesel engines above 0.5 MW ordered world-wide in 2010. 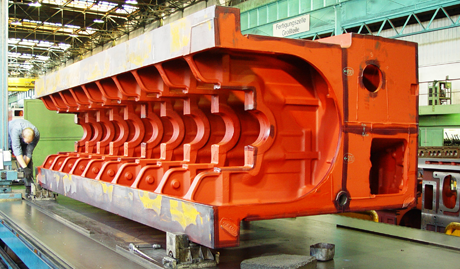 An insight into the production share in percentages for the large manufacturers, MAN Diesel, Wärtsilä, Caterpillar MaK, HHI Himsen and others. This overview has 9 segments, from I to IX. and Mitsubishi have a much smaller market share. The focus of this book: The diesel-engine industry for ship propulsion and power plants. MAN diesel has the largest market share in these sectors.